Making cookies is a special thing. Making the cookies into sandwiches is even more special. Who wouldn't be happy to see a plate of homemade coffee flavoured chocolate cookies with a creamy ganache filling ready to be devoured? These cookies are very easy to pull together and have a solid chewy texture. They also have the perfect density to be sandwiched - they don't crumble or break apart and hold the ganache in place. If you don't want to use ganache I think a coffee flavoured buttercream would work but would make the overall cookie a bit sweeter. Regardless, anyone you make these cookies for will definitely be impressed. Sorry for the choppy post - I'm feeling rusty today! I love ice cream sandwiches and have spent many years eating the typical rectangular chocolate ones with vanilla ice cream. (Who doesn't love those?) If you're looking to up the ante by trying to make your own, these oatmeal coconut cookies are perfect. What you end up with is a very large, thin and chewy cookie that is perfect for filling with ice cream. After they have completely chilled, the cookies do not break or crumble and hold the ice cream perfectly. They are easy to bite through and the finished product is quite substantial - 2 whole cookies and a half cup of ice cream can really fill you up! If they're too big for you, just make smaller cookies and adjust the baking time accordingly. Let the ice cream soften a bit before filling. This process may get a bit messy, but its worth it. The recipe calls for rum raisin ice cream but I substituted Breyers Dark Chocolate Velvet instead. The deep chocolately flavour went wonderfully with the coconut for a truly decadent treat. After trying all three of the new Breyers flavours, I think my favorite is the Banana Cream Pie with the Chocolate Cheesecake in second place and the Chocolate Velvet not far behind. Really though, I just love ice cream and these three did not disappoint. Try them out and see which one you like the best and if you're a resident of Canada you can enter to win some neat prizes if you create your own Breyers Moment. Check out the prizes here and the rules here. The summer is passing me by at a surprisingly fast clip. After spending some relaxing family time in White Rock, I've come home to find I only have 3 weeks of fun left! I made these chipster brownies some time ago. They consists of a very moist and chewy brownie topped with chocolate chip cookie dough. If you like these two treats then you'll love these. I enjoyed the brownie a lot. They were solid, dense and satisfying. I did have some trouble spreading the cookie dough over the brownie layer so there were some gaps where the brownie batter poked through. I also think the cookie batter baked a tad too much and got crispier than I would have liked. Certainly, you can make these brownies sans cookie dough and still have sweet satisfaction. I topped the brownies with Breyers Chocolate Cheesecake ice cream to make it extra special. This rich ice cream blends chocolate and cheesecake to produce a decadent, creamy and tangy treat. The cheesecake part is very subtle and there are no actual cheesecake chunks in the mix. I would say it runs a very close second to the Banana Cream Pie! This month participants were given the option of making one or two types of cookies. I only made the Milans and not the marshmallow ones. I don't do a lot of piped cookies so I was happy to give these a try. The batter was easy to put together but there was a lot of it so I was piping for a long time. I also found the the instructions to pipe 1-inch lengths a little crazy. The cookies were very tiny so I ended up completing the rest by piping about 4-inch lengths and putting two side by side so they'd be a little wider. This worked and eventually I finished. Overall, I think the cookies tasted okay. They were crispy at the edges and chewy in the middle. Piping the batter was unpredictable - some cookies spread into wacky shapes. The ganache was perfect as ganache usually is. Even though they weren't my favourite, they all got eaten. What did help redeem them was pairing them with luscious Breyers Banana Cream Pie ice cream. I had added some coconut extract to the cookies so they were 'tropical' which went perfectly with the banana, vanilla, and graham cracker flavours. To see how the other Daring Bakers fared with their cookies, check out the Daring Kitchen. Thanks to Harbinger for providing the ice cream. Cupcakes are all the rage these days. It's no wonder that Martha Stewart has come out with a cookbook with 175 recipes dedicated to them. Up until now, I have never owned one of her cookbooks but Cupcakes seems to be a great fit for me. The first thing that I noticed is that there is a beautiful colour picture for every single cupcake in the book. This is awesome. The recipes themselves seem straightforward and of course, they can be dressed up with a multitude of frostings, fillings and other visually interesting embellishments. For my first cupcake, I made the Blondie Cupcakes which is a twist on the traditional blondie bar. After mixing up the batter the cupcakes are baked for 30 minutes. The thing to remember is that the batter is dense and not fluffy. There is a fine line to walk here between the cupcake being golden and chewy and burnt and hard. Half an hour is more than normal cupcakes are baked so check carefully and use paper liners. This will make removal extremely easy. The cupcake itself is very nice. It is solid and substantial. They may have seemed hard on the outside but they were chewy on the inside. Store them in a container to keep them moist and enjoy. Thank you to Random House for providing me with this book. After finally using my tart pan for the Bakewell Tart, I looked for some recipes that would allow me to use it again. Since it is cherry season here in Ontario, I chose this custard tart to show off this juicy fruit rather than just eat them all from the bowl. The first thing I needed was a cherry pitter which I finally found at Kitchen Stuff Plus. Pitting cherries is serious business...after I was done my hands were blood red! I'm guessing that the messier you get, the better the cherries. I made this tart two times. The first was with cherries purchased from the grocery store. While the cherries were sweet, they were firm and not juicy but still made a good tart. 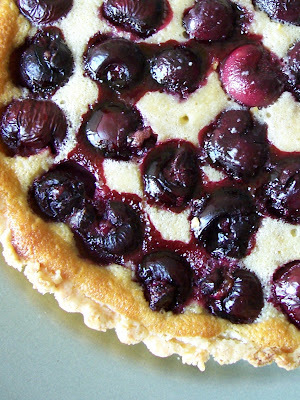 The second tart, pictured to the left, was made with cherries from the local Farmer's Market. You can see how the cherry juice seeped into the custard making it more cohesive than the first tart. I also baked the second tart for five minutes less giving me a firm, yet moist vanilla custard. Overall, this tart was a undisputed hit. The tart dough is forgiving if you tear it, and the preparation is not daunting at all. Pitting the cherries probably took longer than mixing up the filling. If you're looking for something to make with cherries, keep this tart in mind - it's toothsome and fresh! I've got a backlog of muffins waiting to posted about. Here's a quick write-up about two of them. Raspberry Streusel Muffins are exactly what they sound like. Fresh raspberries incorporated into a cakey batter and topped with almond streusel. I did not have slivered almonds so I used ground almonds in the stresuel which was fine though the muffin ended up lacking visual interest. This muffin would be equally great with blueberries. The only issue I had was that the raspberries ended up mainly at the bottom of the muffin despite the higher oven temperature. If any of you have tips on how to keep fresh fruit distributed evenly throughout, I would appreciate them. Overall, a very nice muffin perfect for beginner bakers and sharing with others. Oatmeal Raisin Muffins require a bit more prep work. A portion of the oats are ground for this muffin and combined with regular oats to make a hearty, spicy muffin. They're pretty healthy and if you don't like nuts or raisins, either can be omitted or increased to your liking. Remember to not overbake them or they'll be dry. They take a little bit more effort but can still be pulled together in about 15 minutes. Now that summer is here, I finally feel like I have enough time to devote to baking and blogging. I made these muffins quite a while ago from my new book and wanted to share with you. Sometimes when you bake, substitutions need to be made. I had all the ingredients I needed but had no sunflower seeds. My lovely neighbour graciously let me borrow some pumpkin seeds which I happily used. These muffins are easy to prepare and full of flavour and texture. There is a hint of spiciness from the ginger, zing from the lemon and crunch from the pepitas, so much in fact that I wish I had added more to the batter. They're not your typical muffins but are delicious. I also like the fact that they're mostly made with whole wheat flour making them healthier than most. Give them a try with a seed of your choice! Finally a challenge that allowed me to bring out my as-yet-unused tart pan. The Bakewell Tart consists of three parts - a sweet pastry, jam and frangipane, a lovely almond filling. I opted to do a classic flavour combination of almond paired with raspberry jam and ended up with, in my opinion, a very authentic tasting tart. The crust was solid and held everything together. The jam was seedless store-bought and provided a splash of sweetness and the frangipane was light in texture and the star of the tart. It cut beautifully and tasted even better cold the next day. I really enjoyed this challenge. The tart was easy to prepare, looks impressive and was extremely edible. I will make it a point to work with frangipane again - I loved it. The next recipe I tried out from my new book was the Golden Cinnamon Loaf. Again, I was not disappointed with the results. I won't bother going into the nitty gritty, but if you follow the instructions and give yourself enough time, you will be successful. What you end up with are two great loaves filled with cinnamony goodness. One thing I tried that eased the process was to freeze the butter and then grate it. This worked really well and the butter got evenly distributed throughout the dry ingredients. Also, I didn't crisp them up at the end as I liked them the way they were. This loaf makes excellent toast especially when slathered in butter. I just bought a new baking book called Great Coffee Cakes, Sticky Buns, Muffins & More by Carole Walter. It was an impulse buy since I wanted to get free shipping from Amazon and what I had in my shopping cart didn't add up to $39. Anyways, as I was scrolling through the baking section, I judged this book by its cover and happily proceeded to the checkout. When I got it two days later, I did a quick skim and quickly realized we would become great friends. This is my type of book - home baked goodness on every page. Mr. CB said to go for the gusto and make the sticky buns on the cover - "Why else would have bothered to buy this book?" he said. Good point. So I got some yeast and got to business. There is a deep sense of satisfaction when it comes to baking. After mixing up all kinds of stuff you get a beautiful cake for instance. Baking with yeast takes this satisfaction up to a whole new level. Watching the dough rise and then bake into a warm gooey pecan sticky bun makes my day. They say first impressions are the most important and this book has made an impressive one. The dough recipe is easy to execute as are the accompanying recipes for crumb and sticky buns. What's convenient is that the dough recipe makes about 2 lbs and this can be divided in half to make different treats. The only thing I found finicky was making sticky buns in a muffin tin. They were not that easy to remove though perhaps Mr. CB didn't butter the cavities generously enough. Also, the sticky part got hard and had to be reheated so it didn't get stuck in your teeth. Two minor nuisances for such yummy results. I've been meaning to post about these cookies for about six weeks now. I made them to use up a box of granola I had and didn't want to waste. The recipe comes from Dorie Greenspan and produces a smallish, crunchy cookie filled with lots of little goodies such as raisins, nuts and coconut. The dough is crumbly and requires a little handling but once baked they taste really wholesome. Of course, whatever type of granola you use will influence the flavour of your cookie and mine came out infused with vanilla and complemented with almonds. It is a nice homey, down to earth cookie that can be tailored to suit different tastes. The thing about granola is that sometimes it can get stuck in your teeth. The best way I can think to help with this problem is to brush them and the Oral B Vitality Pro White Toothbrush can help with this. This toothbrush gives you that "I just got my teeth cleaned at the dentist" feel without the anxiety. It took me a while to get used to holding and using the brush because you don't use the traditional brushing motions. Once on, the brush simply needs to be moved across and between the teeth as the cleaning head does all the work. You can add toothpaste as you go and make sure it is securely on the bristles. The first time I used the Vitality, the toothpaste went flying when I turned it on. It takes a little longer to do a good job but the results are worth it. Your teeth feel cleaner and it is easy to make contact with all those hard to reach spots. If you want to share the base, replacement brush heads are available too. Mr. CB has been using the Vitality toothbrush and is sold. His dentist told him it is an excellent product and he's a believer. If you're pressed for time, just do a traditional brush and polish with the Vitality. Perfect for getting rid of granola! Thanks to MS&L for providing the product that was used for this review. I love cheesecake. I always have and always will. This love affair started many years ago. When I was younger we would shop at a grocery store now called Michael-Angelo's. The bakery was situated in the back of the store and sometimes my mom would let us choose something to take home. This is a big deal because it did not happen often. I repeatedly chose a slice of cheesecake. There were only three flavours and I regularly chose the chocolate swirl. I loved its cold creaminess and never tired of it. Fast forward to this month's challenge. I was so happy to be making cheesecake! I decided to make mine with an Oreo crust and broken Oreos stirred into the filling. Simple but delicious. The cheesecake was luscious and infused with vanilla. It wasn't too sweet or firm and the mini versions I made were the perfect serving. Everyone loved them and the recipe is definitely a keeper. If you haven't made cheesecake before and would like to try, make muffin-sized ones. They're less daunting and if you have a big enough pan to fit your muffin tin into you can still do a water bath. Thanks Jenny for a sublime challenge! If you thought that ricotta cheese was only for lasagna and filling ravioli I have some news for you. Ricotta makes one great cookie! When I first saw the recipe I was won over - I love ricotta and cakey cookies. I was also intrigued. What would these cookies taste like? After mixing up the batter (which came together beautifully) the dough was soft but droppable. The cookies came out fluffy and mild tasting. The ricotta was not discernible (to me anyways) but they were delicious. I suppose you could add a little lemon zest to give them some extra flavour but I liked them as they were. Once I added the colourful cream cheese icing they were even better. The sweet tang complemented the cookie beautifully. So bake yourself a little happiness. Spring is here, albeit with some snow, the bulbs are popping up and a long weekend is around the corner. All good things in my book! using 4 eggs in the recipe provided to get, what I thought, was the right consistency. Looking back now I realize it was too soft. As it rested, I made the bechamel and meat sauces - two things I can do. When the time came to roll the pasta, I used the pasta roller attachment for my KitchenAid stand mixer. It was so much fun and effortless to use! Feeding the pasta dough through was really nifty to see even though every sheet I got had holes in it. Now that I'm over the anxiety of trying to make my own pasta, I will definitely give it another go. Once the sheets were rolled, I assembled it all and put it in the oven to bake. When it came time to eat it, I had mostly positive reviews. I only had two issues with the pasta that were my own fault. In some places, the pasta was too thick where it was overlapping and in some places it was too thin and sort of disintegrated into the final dish. However, overall I am pleased with the results as it tasted fantastic! I would like to thank Harbinger for sending me the KitchenAid Artisan Stand Mixer Gourmet Pasta Kit. It came at the perfect time for this Daring Bakers challenge. This amazing kit came with a pasta roller, fettuccine cutter, pasta server and spoon, cleaning brush and two boxes of Ecco La Pasta pasta flour, one egg and one spinach. The roller worked beautifully and the instructions were very easy to follow. I bet you've seen these cookies at your local grocery store. Empire cookies have a distinctly elegant look due in part to the shiny sugar glaze and cherry on top. If you've been meaning to try them out, definitely do - they're delicious. The one aspect of this cookie that I really liked was that there was no chilling time required for the dough. After you mix it up, you can roll it out right away and get to work with your cookie cutters. I would definitely recommend stirring all the ingredients with a wooden spoon as the recipe suggests. I started with my mixer and was a bit worried because the batter was coarse and crumbly but when I switched to a spoon it creamed together nicely. Rolling, cutting and baking went smoothly as well. Once they were cool, I filled some cookies with raspberry jam and some with a non-traditional dark chocolate spread, spread the glaze on and placed a sliver of candied cherry on top. You need to give the cookies a little time for the glaze to set. Once it it, these little sandwiches are perfect little almondy bites. The cookies is tender, the jam tart and the glaze sweet - all components of one great cookie. My neighbour loved it with the raspberry jam and Mr. CB enjoyed the chocolate version. All in all, they're worth the time and effort to make and look great on a platter. Perfect for showers, high tea and lazy Saturday afternoons. I've been slacking off on my baking lately. I have all these recipes earmarked to try but can't get around to making any of them! Out of necessity, and an acute lack of packable lunch snacks, I made muffins last week. The base recipe is for a basic buttermilk muffin. From there you can add in all kinds of stuff to jazz them up. There are some variations after the original recipe that may inspire you. For budding bakers, muffins are a good place to start. Lining the pan means clean up can be kept to a minimum and no fancy techniques are needed to produce tasty baked goods. These muffins are great and not dry at all. The size is perfect for kids, not huge and not flat. They're freezable so you can make them ahead of time and grab one when you're on the go. If you've never had a flourless chocolate cake, you have to make one and eat it. It is divine! I was pretty happy to see that our challenge this month only required three ingredients - chocolate, butter and eggs. I figured I couldn't mess it up too much! The Valentino cake came together beautifully, baked with out a hitch and tasted amazing. It is sort of like fudge but not so creamy and it melts in your mouth like butter. It is definitely rich and thin slices will satisfy any chocolate craving. I topped my cake with plain sweetened whipped cream to let the fabulousness of the cake take centre stage. The Valentino is probably my favourite challenge so far and I can see myself making it again. Yummy! When I started baking brownies, I used a boxed mix. The pictures always looked so tempting and delectable I just had to give them a try. I thought there was no way I could mess them up but I did. Batch after batch came out horribly dry and hard even after I switched to homemade. I wondered how someone could make the elusive moist and chewy brownies I desired. Fast forward to today and I have become better at baking these perennial favourites. This time I have added peanut butter and was rewarded with an awesome brownie. Dense and chocolaty with a peanut butter accent, these brownies are fabulous. The icing complements the bittersweet brownies by adding a little sweetness. They taste great at room temperature and even better straight out of the fridge. After missing a few DB challenges, I was glad to be participating this month because we were making tuiles. I have only made bowl-shaped ones once before and was looking forward to trying a new shape. The tuile batter is pretty straightforward and made with easy to access ingredients. The only things I didn't sift were the flour and icing sugar. I don't think it made a big difference but I found that I still had small bits of butter after everything was incorporated. The batter, even after refrigeration, was still thinnish which sometimes led to wacky-shaped tuiles rather than circular. I made a small portion of chocolate batter so some tuiles had chocolate striping and some were plain. After they were baked, I waited a few seconds before lifting off and rolling around a wooden spoon handle. They were a little sticky and some tore. After they cooled, I filled them with PC Dark Chocolate Spread and my kids ate them all. I paired some with strawberry frozen yogurt and they ate those too. My tuiles were a bit soft and definitely not crunchy - most likely caused by human error. The whole process was not difficult and fun to try. Thanks for a great challenge! I used to avoid yeasted breads because I thought they were difficult and temperamental to work with. Would the yeast rise? What's the right water temperature? After many attempts, some successful, some not, I feel much more comfortable working with those little magical granules. Pizza is something I make almost every week. Having a good pizza dough recipe makes all the difference. A bad recipe can frustrate you to no end but a good one means limitless pizza possibilities. The one I use is easy to work with and does not shrink when I roll it out. I substitute some whole wheat flour in for the all-purpose to make it healthier. You can use it as a pizza base, for cheesy soft breadsticks or Middle Eastern flatbread (Manakeesh Bil Za'atar) as I did. Sour Cream Pound Cake & A Winner! Well I hope all of you had a great week. I did but I'm so glad its Friday! So in anticipation of the weekend to come, I will tell you all about this fabulous pound cake and hope it inspires you to bake something yummy. Pound cake is really really versatile. You can eat it as is, toast it, use it in trifle, to dip in chocolate fondue...and probably a whole load of other things I haven't heard of. Everyone should have one great pound cake recipe and this one is mine and should be yours if you don't have one already. The cake is perfectly moist and dense. It came out lovely, golden and delicious and is the perfect treat to have wit tea, coffee, lattes, espresso...well, you get the idea. I would also like to congratulate Allison who was the winner of the book giveaway! Allison if you could send me an e-mail (located at the bottom of the right column) with your address, your book will be in the mail as soon as possible. Thank you to all of you who entered and have a great weekend! As my winter vacation comes to a close I want to wish you all a very Happy New Year! Having a couple weeks off really helped me to get back on track and hopefully back to baking on a regular basis. As a Thank You to all of you, I'm giving away one copy of Little Cakes from the Whimsical Bakehouse published by Random House. All you need to do is leave a comment and I'll announce the winner on January 9, 2009. So if you're thinking of dusting of your beaters, cookies are always an easy way to start baking. If you like chocolate, these Dark & Dangerous cookies will fit the bill. They're chocolatey, chewy and sweet. Not my most favourite cookie, but one that will satisfy a craving tout de suite.